CTA Hall of Famer and inventor Dean Kamen’s FIRST robotics program inspires two long-time industry professionals to engage with workforce of tomorrow. 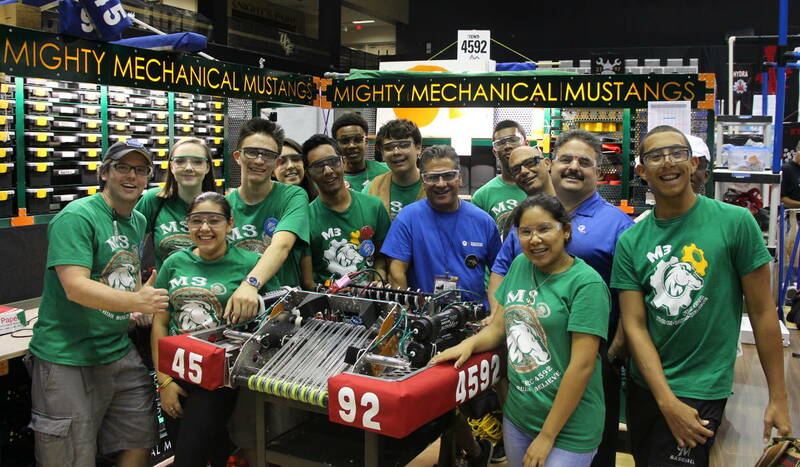 Ron Callis (far left) volunteers with The Mighty Mustangs robotics team. Robotics is a strong breeding ground for future industry technicians. Where are the technicians of tomorrow going to come from? Look no further than robotics, says two industry veterans. Ron Callis, CEO of OneFirefly, and David Kaplan, CEO of Custom Business Solutions, credit inventor Dean Kamen for breeding the robotics culture among kids who just might become the much-needed future workforce for the custom electronics industry. Kamen, the inventor of the self-balancing human transporter Segway, is being inducted into the Consumer Technology Association’s (CTA) Hall of Fame in November in the “Innovator/Technologist” category (along with Ray Kurzweil of Google). Kamen is an inventor, entrepreneur and tireless advocate for science and technology and holds more than 440 U.S. and foreign patents, but it is his work with kids and robotics that might save the custom electronics industry.